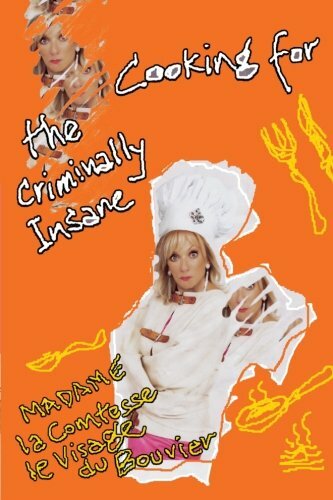 COOKING FOR THE CRIMINALLY INSANE is a highly botoxed, stiletto-heeled romp through the sacred ground of designer cookbooks. Madame la Comtesse le Visage du Bouvier,(not her real name,) prefers to be know as Wallis Merrick-Thompson, (also not her real name) is the acclaimed author of Cellphones for Schizophrenics, a crazy look at crazy people: Hairplugs and Ferraris, the mid-life crisis-real or imagined - no, it's real all right; and dentists on Harleys, what you didn't know about Sheldon. This is a how-to prepare the "Ultimate" dinner party in it's entirely. For what you are about to receive, fair warning... This 'cook' book is not for the feint of heart or stomach... Cooking for the Criminally Insane or CFTCI (as we like to call it) will tantalize your taste buds and your funny-bone, "Foodies" beware and whatever you do, do NOT try this at home.